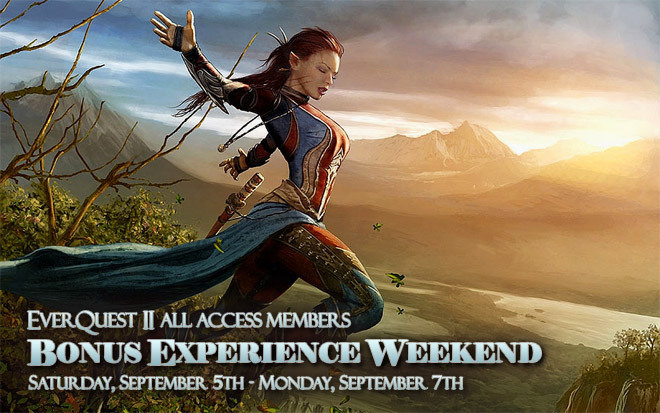 All day Saturday, Sunday, and Monday this Labor Day weekend, All Access customers will get to enjoy 100% Bonus XP on non-TLE servers. This weekend is a great time to be an All Access member! Why? Because you’ll get DOUBLE XP (Adventure, Tradeskill, AA) all weekend long! The Double XP bonus will turn on at 12:01AM PDT on Saturday, September 5th and will last three full days. This means you have until 11:59PM PDT on Monday, September 7 to fill up those XP bars! The Double XP bonuses will be available for All Access members on all traditional servers. While the bonus will not be available on Stormhold and Deathtoll, there are still mighty adventures awaiting All Access members there. Remember, you must be a member to access those special servers. First non-douchey comment about it. Thanks.